Ever breaking the boundaries of meteorology, The Weather Channel has announced that just as organized tropical storm systems have names, major winter storms will now be named too! "Draco"? "Gandolf"? "Khan"? "Q"? "Rocky"? To the left you see Orko, the Trollan magician/court jester from He-Man and the Masters of the Universe. 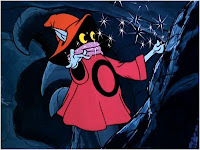 That is what people mostly think of when they hear "Orko". 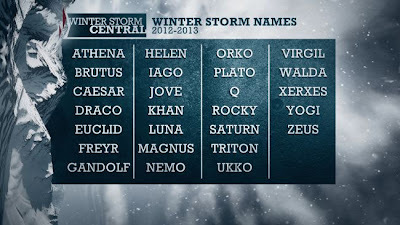 But according to The Weather Channel the name "Orko" was chosen because it's "the thunder god in Basque mythology". Yes, The Weather Channel went to a region of Spain to look for an obscure deity to be on their winter storm list. And they expect us to buh-leeeve that? Jason Samenow writes some thoughts about this on the Washington Post's website. And make sure to stock up on plenty of bread and milk before we get slammed by Yogi. In fact, if you type Orko into Wikipedia it takes you to the MOTU character and not the Basque deity. "This system is bringing with it record amounts of snow. It will leave you buried alive. Buried aliiiive..."